View from Lake Como. The tower which tops the hill on the right is the Castello Baradello. With 215,320 arrivals, in 2013 Como was the fourth most visited city in Lombardy after Milan, Bergamo and Brescia. 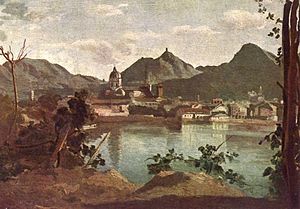 City and Lake Como, painted by Jean-Baptiste-Camille Corot, 1834. As a curiosity, the Rockefeller fountain that today stands in the Bronx Zoo in New York City was once in the main square (Piazza Cavour) by the lakeside. It was bought by William Rockefeller in 1902 for 3,500 lire (the estimated equivalent then of $637). The park of Villa Olmo and the Cathedral. 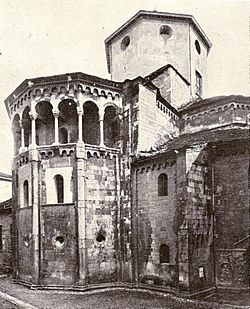 The church of San Fedele, apse area. 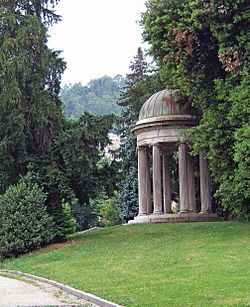 The Neoclassical English landscape gardens of Villa Olmo. The economy of Como, until the end of the 1980s, was traditionally based on industry; in particular, the city was world-famous for its silk manufacturers, but in recent years cheap competition from China has significantly reduced profit margins and many small and mid-sized firms have gone out of business. As a consequence manufacturing is no longer the economic driver and the city has been absorbed into Milan's metropolitan area where it mainly provides workers to the service industry sector. 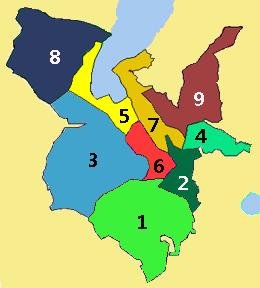 A significant number of residents is employed in the nearby industrial areas of the Swiss towns of Lugano and Mendrisio, primarily in the industrial sector, health care services and in the hospitality industry; the 30 km (19 mi) commute is beneficial as wages in Switzerland are notably higher. For these reasons, tourism has become increasingly important for the local economy since the 1990s. The city and the lake have been chosen as the filming location for various recent popular feature films, and this, together with the increasing presence of celebrities who have bought lakeside properties, has heightened the city's international profile and given a further boost to international tourism. 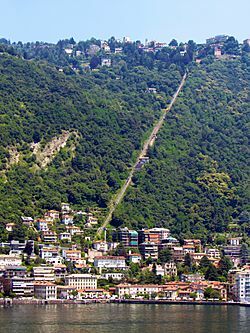 The city of Como has seen its population count increase until it peaked at almost 100,000 inhabitants in the 1970s, when manufacturing, especially the silk industry, was in its boom years. As production began to decline, the population decreased by almost 20,000 people until the start of the 21st century, when the city saw its population grow again by more than six thousand, mainly because of immigration from Asia, Eastern Europe and North Africa. As at 31 December 2010, there were 11,156 resident aliens living in the city. A typical plate of polenta (here depicted with rabbit), a very common and traditional dish of the region. 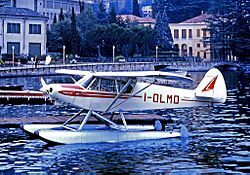 Piper Super Cub floatplane at Como's water aerodrome. Notable sports clubs are a basketball team, two time winner of the FIBA EuroLeague Women, and Calcio Como, a football team. There are also numerous recreational activities available for tourists such as pedal-boating, fishing, walking and seaplane rentals. Como Facts for Kids. Kiddle Encyclopedia.